Artistic rendition of the Kepler-47 circumbinary planet system. The three planets with the large middle planet being the newly discovered Kepler47d. Credit: NASA/JPLCaltech/T. Pyle. In a new study, researchers have discovered a new planet in the Kepler-47 system. This is the third planet in the system, and now Kepler-47 has three planets and it orbits two suns. It is the only known multi-planet circumbinary system. Circumbinary planets are planets that orbit two stars. The discovery makes the Kepler-47 system the most interesting of the binary-star worlds. The research was conducted by a team of researchers, who were led by astronomers at San Diego State University. In the study, the team analyzed data from NASA’s Kepler space telescope. They found the new Neptune-to-Saturn-size planet orbiting between two previously known planets. They named it Kepler-47d, and it is the largest of the three planets in the Kepler-47 system. The team used a transit method to detect the new planet. In the method, If the orbital plane of the planet is aligned edge-on as seen from Earth, the planet can pass in front of the host stars. This can lead to a measurable decrease in the observed brightness. The new planet was not detected earlier due to weak transit signals. The researchers suggest that the new discovery could help with the understanding of the system. They now know the planets in this circumbinary system are very low density, even less than that of Saturn, which has the lowest density in our Solar system. 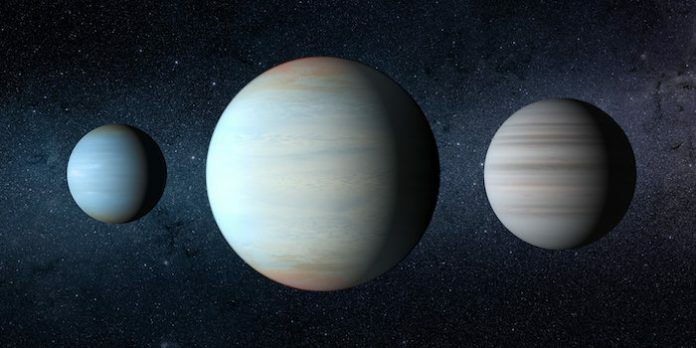 The team also found that Kepler-47d’s equilibrium temperature is roughly 50 o F, while Kepler-47c is 26 o F.
But the innermost planet, which is also the smallest circumbinary planet, has a much hotter 336 o F.
Researchers suggest that closely-packed, low-density planets are very common in our galaxy and that Kepler-47 is common to single-star and circumbinary planetary systems. The lead author of the study is SDSU astronomer Jerome Orosz.